You can instantly increase the value of your home by upgrading your old garage door. While homeowners often jump at the chance to makeover their kitchens and bathrooms, many are quick to forget one of the most important aspects of the home: curb appeal. Replacing your garage door gives the front of your home a facelift. Additionally, new garage doors can offer up to a 98 percent return on investment. Maximizing your garage door curb appeal can be tricky. The garage encompasses one-third of your front yard curb appeal, so it’s important that the door you choose creates balance, enhances aesthetic contrast and restores charm to your home’s exterior. Each of these can be achieved by selecting a garage door material and design that accentuates the front of your home. With additional lighting techniques and a little accessorizing, a garage door makeover can supercharge your curb appeal. Small dents and scratches: Though small dents and scratches can be annoying eyesores, larger blemishes can be a cause for serious concern. Rust can enter into deep scratches, eventually making the garage door prone to breaking. Tend to all scratches as soon as possible to restore the beauty of your garage door. Large dents: Sizeable dents can also affect the long-term integrity of your garage door system. Any trauma can cause the door to become off-balanced and place excessive pressure on the tracks. Eventually, this will lead to a costly breakdown. Warps in wood: For owners of wooden garage doors, be mindful of warps or cracks that may appear. Over time, these imperfections will permanently alter the structure of the door, requiring a full replacement. Should You Replace a Garage Door System by Yourself? We do not recommend that you attempt to fix or replace your garage door and system on your own. There are a number of dangers associated with do-it-yourself garage door repairs that can lead to serious injury and cause permanent damage. Each garage door is unique, requiring specific parts and tools to responsibly fix problems that arise. Any time you attempt to take apart your garage system, you risk serious injury or death from a falling door or broken torsion springs. It’s vital that your garage door installation is completed by trained professionals offering a warranty on parts and service. Instead of choosing “cheap” DIY solutions that may cause irreparable damage, rely on the knowledge and experience of trained professionals. Stapley Action Garage Door’s team of garage door specialists will provide you with affordable and reliable garage door parts, installation and service. If you’ve decided to replace your worn-out garage door, it’s time to choose the material that’s best for your unique needs. Before deciding on the design and appearance of the door, it’s important to determine which material will offer you the most long-term benefits. Garage doors in Mesa need to endure seasonal variations in weather throughout the year, which range from mild wind and rain to sweltering three-digit temperatures. First, consider three of the most common garage door materials used: steel, wood and aluminum. 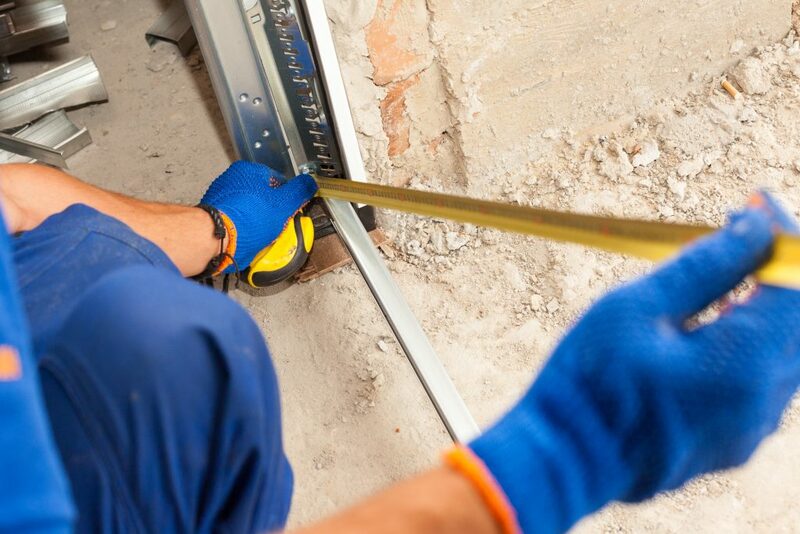 There’s a reason steel garage doors became a popular option for homeowners. Arguably the ideal material to construct garage doors from, steel provides extended durability. Unlike wood, steel will not rot or warp. Though these doors are subject to damage and corrosion, the limited precipitation Mesa receives makes a steel garage door an attractive option for long-term, low-maintenance reliability. There are over a dozen factory finishes available for steel garage doors, including wood-look finishes. With a variety of panel designs, textures and paint colors, a steel garage door accents both modern and contemporary home styles. Durability, customization and visual appeal have made wood garage doors a popular choice for homeowners. Offering unlimited design possibilities, a variety of woods can be stained or painted during production or finished onsite. Raised, recessed and flush panel natural wood garage doors will dramatically enhance your curb appeal. If you want your garage door to match your front door, wood can make it happen. 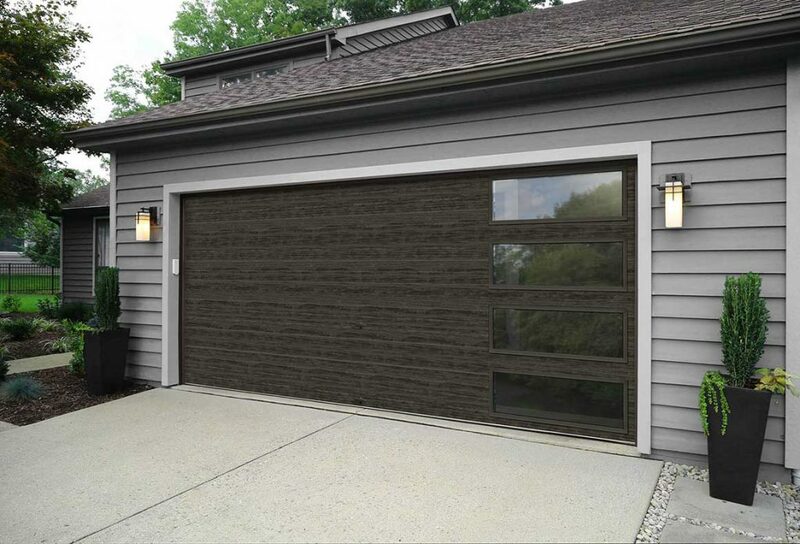 While wood offers a classic look, aluminum garage doors provide modern curb appeal. Make a bold statement with painting and glazing options. Increase the uniqueness of your aluminum garage doors by adding clear, tinted or translucent glass panels. Though glass and aluminum are susceptible to scratches and dents, these stylish doors will stand out from every other home on the block. To lower their maintenance costs, some homeowners are choosing to forego the traditional garage door materials for the benefits in appearance and performance synthetic materials offer. Along with our wonderful selection of wood, steel and aluminum garage doors, we also offer collections of fine composite and synthetically made doors. Would you like the look of a wood garage door without the maintenance? If so, a composite garage door may be right for your home. Unlike real wood, composite wood will not warp or require touch-up painting. The composite is also stronger and more affordable than solid wood garage doors. As a reasonable alternative to steel, fiberglass garage doors are steel doors that are sealed with a fiberglass coating. Fiberglass doors are available in faux wood designs, giving you the appearance of wood with the increased durability of steel. Lightweight fiberglass doors require limited maintenance, and their environmental-resistant properties allow them to retain their appearance for years. Before considering a traditional material like wood or steel, consider the many advantages of a vinyl garage door. Although it may not have the sheer durability of steel, vinyl makes up for it in endurance. This material is more resistant to dents and scratches. While steel may rust and wood may rot, vinyl will endure. Its ability to withstand everyday wear and tear makes maintaining your vinyl garage door effortless. If you’re looking for a lightweight garage door that will add a subtle touch of style, vinyl is a great choice. Typically, vinyl doors retain their color throughout the entire thickness of the door, making damage harder to notice. Though the appearance of a vinyl door is impressive, it cannot be refinished like steel or wood. Along with a reliable material, the garage door you choose needs to match or complement the look of your home. When selecting a new garage door, one of the top priorities for homeowners is appearance. Since this part of your home directly impacts your front yard curb appeal, it’s important that the design of the door complements your exterior. 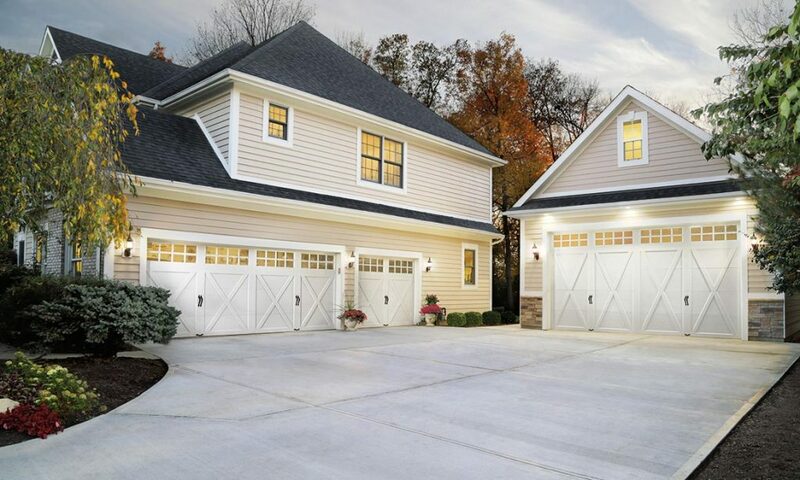 For example, a clean-lined modern home should feature a simple garage door design to highlight a streamlined aesthetic. Traditional: Traditional garage doors feature multiple panel designs that add a classic look to your home. Standard short and long raised panels will add depth to the door. Flush panels are flat with a slight texture that subtly complements the overall appearance of the home without drawing significant attention to the garage itself. Contemporary: For clean and functional garage door curb appeal, choose a contemporary design. These doors are ideal for owners of modern homes that want to stray from the traditional panel doors. Carriage-house: Carriage house doors are both charming and practical, combining a rustic appearance with modern convenience. Though original carriage house doors were made of wood, they are now made from a variety of materials and can be customized to your desire. 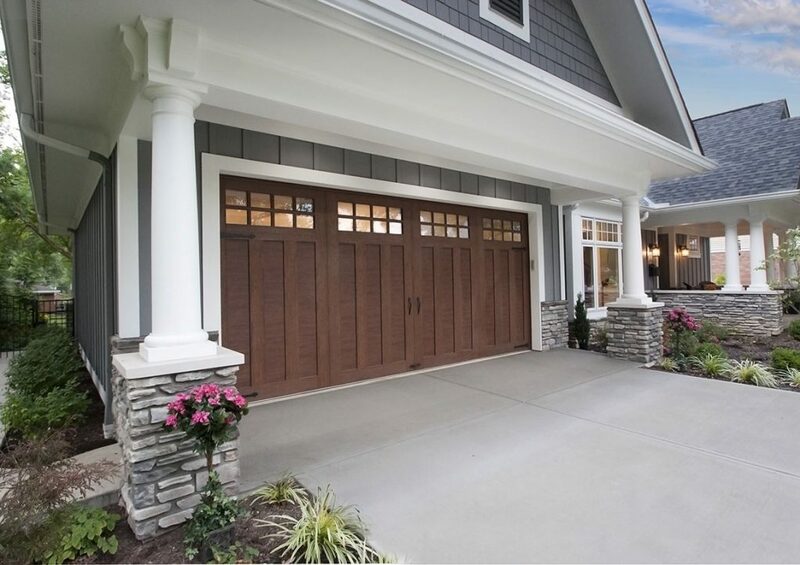 These unique garage doors are perfect for enhancing your front yard curb appeal in an elaborate yet trendy way. The best way to determine which design will look best on your house is to see it in place. Clopay’s garage door design tool allows you to see how different garage door designs will look against your home. Take a look at these other great garage door design ideas, and let one of Stapley Action Garage Door’s friendly associates show you our fantastic range of residential garage door styles. A little paint can go a long way: Painting your garage door to match the color of your siding, or leaving it white, is recommended. However, you can also unify your exterior color scheme by painting your garage door the same color as your front door. Landscaping is a great addition: If you’d like to reduce your garage’s negative impact on your curb appeal, landscaping will help. Line the walls of your garage with plants that soften the edges. Surround the walkways around the garage with midsize shrubs and flowers, or illuminate them with landscape lighting. Balancing your design doesn’t take much: Give your garage a subtle cosmetic boost by purchasing small items that will balance your design. Additions like tasteful door handles, molding detail around the garage and new house numbers will lend extra elegance to your new door. Not all garage door accessories need to be permanent: Adorn your garage door with outdoor lights, trimmings and other festive decorations. No matter how modest or extravagant your ideas may be, your garage door is the perfect platform to spruce up for any season. 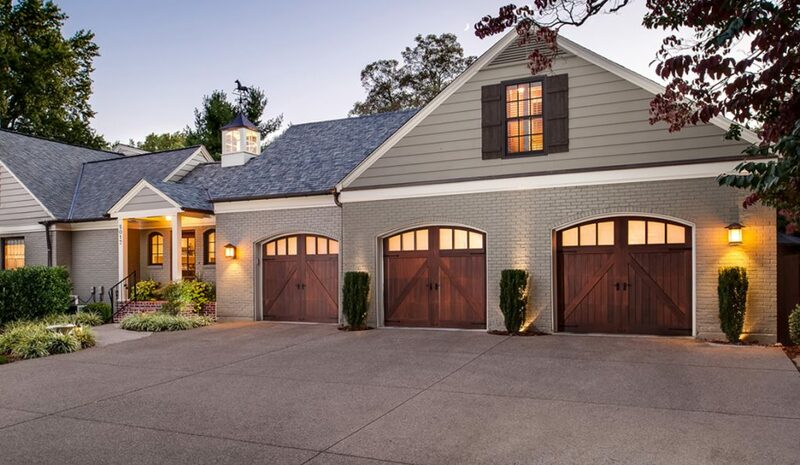 Adding windows can increase the curb appeal of your garage door. They can be coordinated with the existing exterior windows and make the garage feel like an extension of — not an addition to — the home. You can also customize the windows by using tempered or insulated glass and experimenting with various shapes and sizes. Natural light is always an advantage, even in your garage. Windows are ideal for those who use their garages for more than parking. Utilizing windows will help cut down on the wear and tear incurred by your garage door, sparing you from excessively opening and closing it every time you need extra light. As with any renovation, there are potential drawbacks to selecting a garage door with windows. Glass is susceptible to damage, which may create a future repair cost. Windows are less energy efficient as well, which may be a disadvantage if you use your garage for storage or as a workspace. Windows also allow others a view into your garage, decreasing your privacy. Still undecided on whether or not your garage doors need windows? The expert designers at Stapley Action Garage Door are here to help. Browse one of our modern collections and see if windows fit into your garage door design ideas. Now that you’ve turned your garage door design ideas into a reality, it’s time to shine a spotlight on your new and improved front yard curb appeal. Exterior lighting enhances your home’s appearance and ensures your curb appeal isn’t lost in the night. One way to set the tone for your home is to add lighting to the soffits above your garage doors so that the doors are always on display. Whether you use solar and floodlights or recessed and wall-mounted lighting, there are plenty of lighting techniques that can give your garage doors added curb appeal. Attractive lights can double as décor that complement the exterior. Alternatively, you can hide lighting within your landscape or soffits to illuminate the area without distractive fixtures. Lighting placement is also key. External garage lights can also increase safety and security around the home if placed correctly. When planning your design, consider how the lights will showcase the garage area while providing maximum visibility for you and your family. Let’s face it: Front yard curb appeal matters. Unfortunately, an outdated garage can negatively impact your exterior appearance and turn away future buyers. If you believe it’s time to replace your old garage door, the service experts at Stapley Action Garage Door would be happy to assist you. Taking a step-by-step approach to choosing the right garage door for your home begins with selecting the material that suits your needs. While materials like steel, wood and aluminum are tried-and-true choices that homeowners have trusted for years, there are other materials available that may cater to your specific needs. Arizona residents shopping for new garage doors should speak with a professional to learn more about the advantages and disadvantages of each material. After selecting a material and design, you should consider maximizing your garage door curb appeal with other stylish features. Updating hardware, installing exterior lighting, maintaining the landscape and removing eyesores from around the garage can greatly bolster curb appeal. The moment you step back and marvel at the finished product, you’ll be glad you trusted Stapley to help complete your vision. Take your garage door curb appeal to the next level. Stapley Action Garage Door knows how important your front yard curb appeal is. Allow our garage door technicians to enhance the beauty of your home with one of the amazing garage doors in our collection. For over 30 years, we’ve been providing homeowners throughout the Phoenix area with high-quality garage doors. Visit our website to find out more about our products and to learn helpful tips on responsibly maintaining your garage doors. Our satisfied customers will agree: Stapley Action Garage Door has the perfect selection of garage doors that will boost the curb appeal of any home. With additional lighting techniques and a little accessorizing, a garage door makeover can supercharge your curb appeal.